The encumbrance certificate contains all the transactions registered relating to particular property for a period (as required). It is advisable to get encumbrance certificate before effecting any transactions as it will give information about previous transactions. This will also help in arriving at proper entitlement of the property. It is true that issue of encumbrance certificate takes time, as the entries are searched manually before 1987. From 1987 onwards the indexes are computerised and the encumbrance certificates are issued on the spot. Special counters have been opened to receive applications and certificates are issued on demand without delay. Applications for Encumbrance Certificate can be submitted through Online Application Form and the Encumbrance Certificate will be delivered at your door step. ** This User Manual deals with the User Registration procedure in portal with step by step instructions to create a user Registration identification. 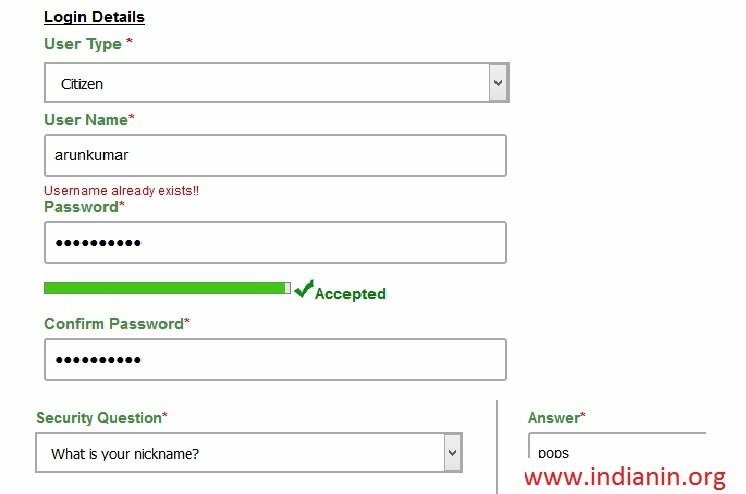 ** Only after creating a Registration ID can the user proceed to create a document online. Step 1 : Go the official web page Hold the cursor over the registration tab on the right side top of the screen. Select user registration option to proceed further for registering an user. Step 11 : Enter Phone No. Step 12 : Enter Identification No. Step 9 : Click on the complete registration button. Step 3 : Click on the login button. ** SRO,Village,Survey No.,Subdivision and Dates are search criteria.Pls.carefully Fillup Those Columns. 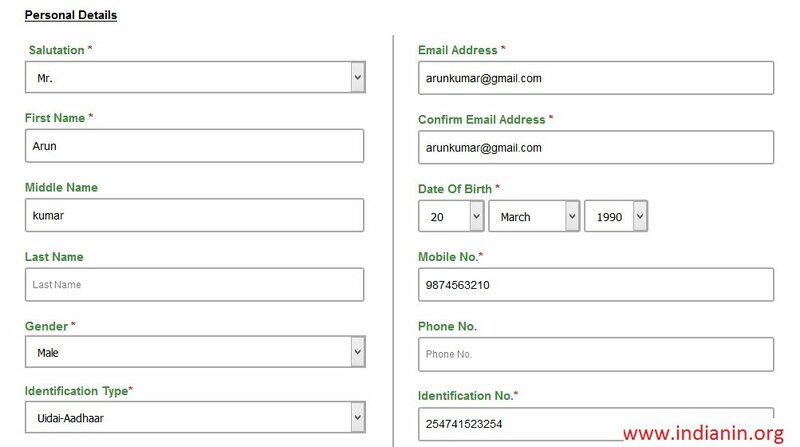 ** You can also Fillup the EC application in TAMIL using any TAB tamil font in Tamilnet’99 Standard. ** Enter all the known details for accuracy and to avoid delay. ** Enter Extent and declared owner for getting proper EC. ** ls. Mention LandMark near your Postal address and aslo mention your availability on that address in the remarks column. ** To Add more information about Ward No.,Block No.,Survey No.,Sub Div No.and Dates click “Add One More” Button. ** To avoid Date Entry Errors please check whether you have entered Valid Dates. 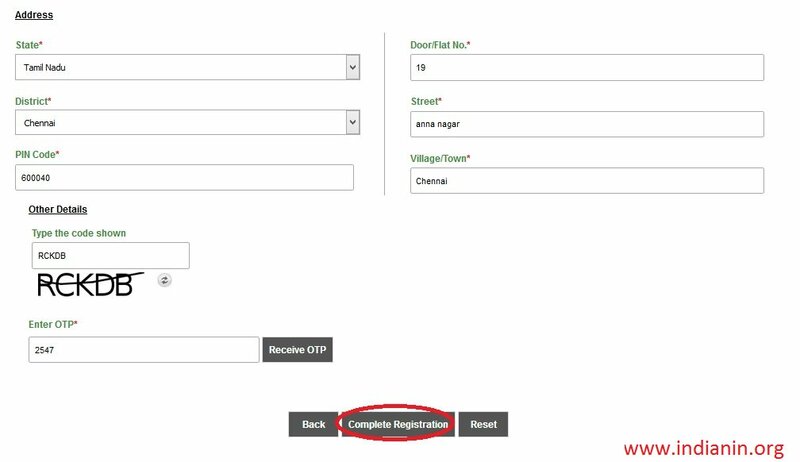 You can search/ view Encumbrance Certificate online in TNReginet Registration department. Step 1 : Go to the portal of TNReginet Registration department. 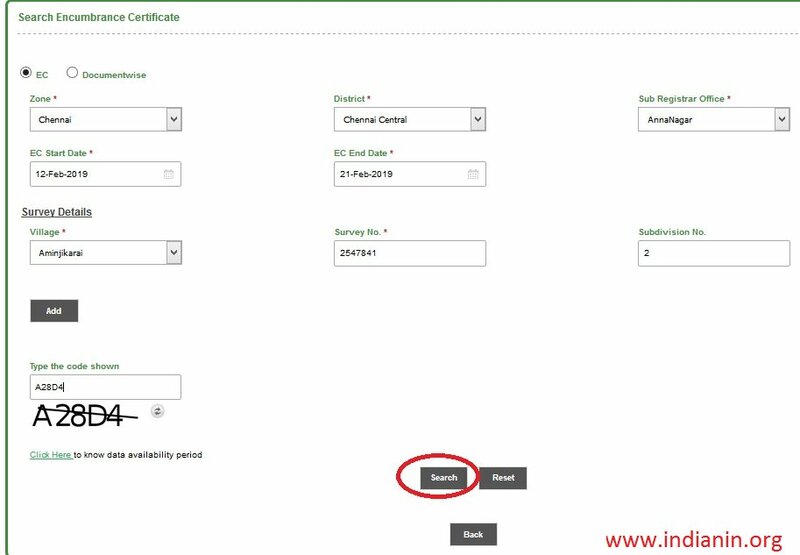 Click Search/ View EC button available under Encumbrance Certificate tab. Step 10 : Select Subdivision No. Step 12 : Click on search button. 1. If the search result of provided Survey Numbers produces more than 200 property transactions, you will get ID. In this case, you can split the search duration (reducing number of years) and can make simple search and get EC immediately. 2. 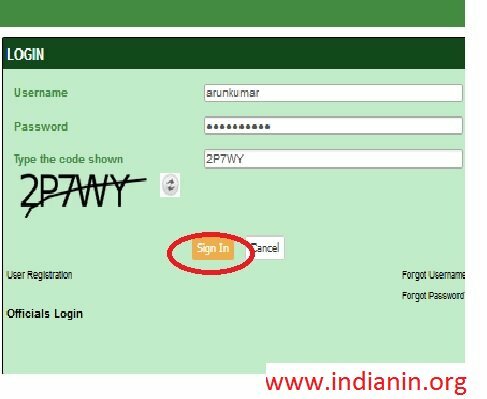 Now you are required enter the given ID in the space provided in the download link after the duration provided by the site. You will get EC as downloadable. 3. Your search ID will be valid upto 48 hours from the time of search. Then, it becomes invalid. Please try new search. 4. Please enter your document number and year in document search details provided in the same page and get the details. 5. Please make new EC search entering the correct details provided in the document search. Then you will get your property transaction in the EC. 1. “Encumbrance Certificates” are not being issued in time and the staff also do not respond properly to our requests. It is true that issue of encumbrance certificate takes time, as the entries are searched manually before 1987. From 1987 onwards the indexes are computerised and the encumbrance certificates are issued on the spot. Special counters have been opened to receive applications and certificates are issued on demand without delay. Applications for Encumbrance Certificate can be submitted through Online Application Form and the Encumbrance Certificate will be delivered at your door step. 2. What is the time limit for getting the Encumbrance Certificate? As per the Standing Order 979(ii) “in respect of the offices and period which is not computerised the Encumbrance certificate shall be completed within 4 days from the date of admission of the application exclusive of that date and interveing holidays”. 3. What is an encumbrance certificate? Why do we need? ** Before deciding to purchase a property, ascertain the transactions effected in respect of the property proposed to be purchased by getting the encumbrance certificate. ** Apply online and get EC at door step. Ascertain the value of the property from this site through Guideline value of page. ** Applications are available free of cost. You can also download the required form. You can also apply online for EC and get it delivered at your door step. ** Give full particulars of the property in the application with the required fee. ** Get legal opinion as to the title of the property and the genuineness of the seller. ** If any extra demand is made, he is liable for criminal prosecution under the Act, besides getting his license cancelled. ** Stamp papers are also sold by The Sub Registrars, Treasuries, and Assistant Superintendent of Stamps, Chennai. ** Stamp duty may also be paid in cash or D.D. ** In chennai zone e-stamping has been introduced. ** Executants of the document if they use the model deeds available on the registraion website. ** Fees for drafting / copying various kinds of deeds by the licensed writers is prescribed by the Government. ** In the Sub-Registrar’s office under its jurisdiction, the property situates (or)In the District Registrar’s office of that Registration District. ** Registration done out side from the state is null and void. ** If you don’t know the jurisdiction of registration offices please ascertain is from the site by provided the street name or village name or village name at Field offices detail. ** Documents Needed For Registration. ** Duty stamped signed and Executed document. ** it requires the claimant of the sale Document also to sign in the sale deed and also appear before the registering officer for registration of the sale deed. ** Patta Transfer application with court fee lable of Re. 7/- duly filled and signed. Registration Fee : 1% on the market value of property. Stamp Duty : 7% on the market value of the greater value. Registration Fee : 1% on the market value of greater value property. Registration Fee : 1% subject to a maximum of Rs.4000/- for each share. Commercial Taxes And Registration Department. Amendments To Tamil Nadu Document Writers Licence Rules. ** For measuring house and preparing statement under sub-rule (1-A) of rule 3 of the Tamil Nadu Stamp (Prevention of under valuation of Instruments) Rules, 1968.